Mark writes: My HTC Evo 4G from Sprint has the worst battery life that I ever experienced from a smart phone. I have to manually stop running programs and applications in my application settings to conserve battery life. How can I further extend my phone’s battery life? With its jumbo 4.3-inch display, front-facing camera for video chat, and access to speedy 4G cellular data networks, the HTC Evo 4G on Sprint was one of the most popular Android smartphones released last year—and unfortunately, it also ranks up there as one of the worst battery hogs. Here are a few quick tips to squeezing a little more juice out of the Evo 4G’s battery—and yes, many of these tips apply to other Android phones, too. Your new Power Control widget has a row of five icons: one for Wi-Fi, another for Bluetooth, then GPS, background sync, and display brightness. Running low on battery? Just start tapping on the icons to turn your phone’s most power-hungry features off. Personally, I’d start with Bluetooth (especially if you don’t have any wireless headsets or other Bluetooth devices connected), followed GPS (a notorious battery killer), brightness (ditto), background sync (which stops your phone from automatically fetching data such as email, Facebook and Twitter updates, weather and stock info), and finally Wi-Fi. Who doesn’t love gorgeous, “live” wallpaper that’s continuously pulsing, twirling, or otherwise swirling around on their Android smartphone? Personally, I think they’re great; on the other hand, they’ll also do a serious number of your phone’s battery. Swap out your dazzling animated wallpaper in favor of a boring but energy-efficient static background. From your Android phone’s home screen, tap the Menu key below the screen, select Wallpaper, then choose a new, non-“live” background. One of the biggest reasons that the HTC Evo 4G in particular has such poor battery life also happens to be one of its main selling points: its support for Sprint’s speedy, 4G WiMax network, which offers data speeds several times faster than those you’ll get over Sprint’s older 3G network. The only problem with the Evo’s 4G radio, though, is that it puts a serious strain on the battery whenever you’re in an iffy 4G signal area—in other words, the harder the Evo has to look to find a good 4G signal, the faster it’ll drain your battery. So if you see that your 4G signal is fading and you’re running low on juice, consider switching the Evo over to a 3G-only mode. To do so, just tap and drag down the notification panel from the top of the Evo’s display, then tap the “4G” button to toggle the 4G radio on and off. All those snazzy home-screen widgets you have set up on your Android phone—you know, the ones with the latest weather, updates from your Facebook and Twitter pals, recent email messages, and world headlines—each use a little power every time they sync themselves over the Internet. And while it’s entirely possible that you want your phone checking email every 15 minutes or so, forcing it to update your Twitter feed on an hourly basis may be a bit excessive. Luckily, you can manage exactly how often your Android phone is updating each of your accounts. From the Android application launcher, tap Settings, then “Accounts & sync” to see all the accounts you’ve synced onto your phone. Now, just tap an account to tweak how often you’d like it to automatically updated in the background. For email, I recommend no more frequently than once an hour; for weather, stocks, Twitter, and other “news”-type widgets, I’d set them to update themselves only when they’re opened. 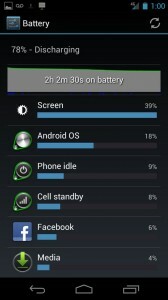 Thanks to Ice Cream Sandwich, it’s easy to find out which apps are hogging the most power. Update: Have the new Samsung Galaxy Nexus, or an Android phone with the “Ice Cream Sandwich” update? If so, you’re in luck. A new “Battery usage” setting gives you much more detail on how your battery is faring, along with a list of apps that are hogging the most juice. 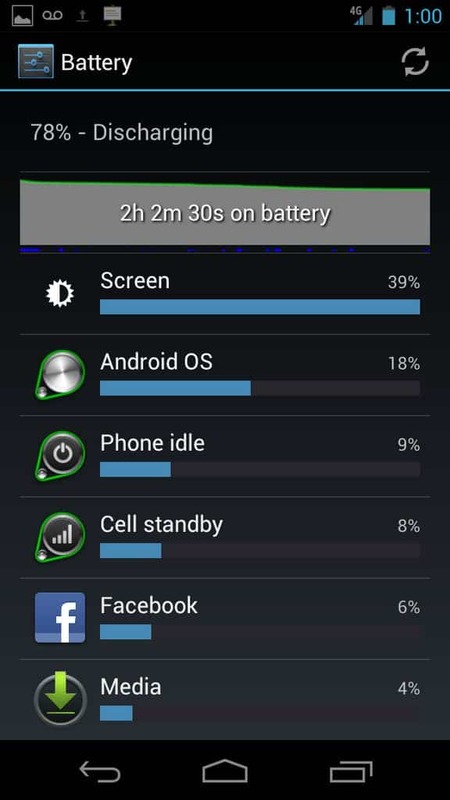 Just tap the Settings icon and select Battery Usage to get started. Have more questions about preserving battery life on your phone? Got any tips you’d like to share? Let us know!